These tiny, perfectly formed 10g balls of mercerised cotton have become Instagram stars in their own right thanks to their downright cuteness. 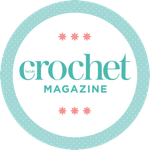 With 25m/27yds of yarn in each ball and available in 100 pretty colours they are perfect for small projects such as decorations or amigurumi – although we know quite a few crocheters who simply display them in jars like sweets! Win the entire set of 100 balls, thanks to our generous friends at Yarn and Colors! Why not visit our competition page and enter?